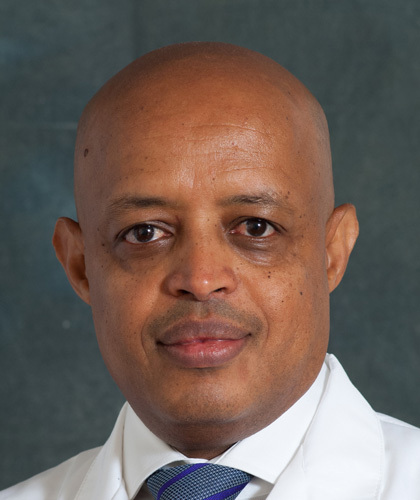 Growing up in my native country Ethiopia, there were various events in my childhood that sparked my interest in pursuing a career in medicine. The earliest memory that I have of dreaming to be a doctor was when I came down with an acute illness. I was 11 at the time and had to share a hospital room with other sick children while I was recovering from my illness. My youthful curiosity about our different aliments and the treatments we received was my initial desire to become a medical doctor. I have a diverse background. I practiced general pediatrics in Ethiopia and Botswana before I emigrated to the United States. I enjoy working with babies, as they are so resilient and defy adversities by getting better with the help of technology and dedication from the neonatal care team. It gives me the ultimate reward and blessing to see babies who I met in the delivery room finally being discharged after a lengthy stay in the Neonatal Intensive Care Unit. In my spare time, I enjoy watching sports and travelling with my family.